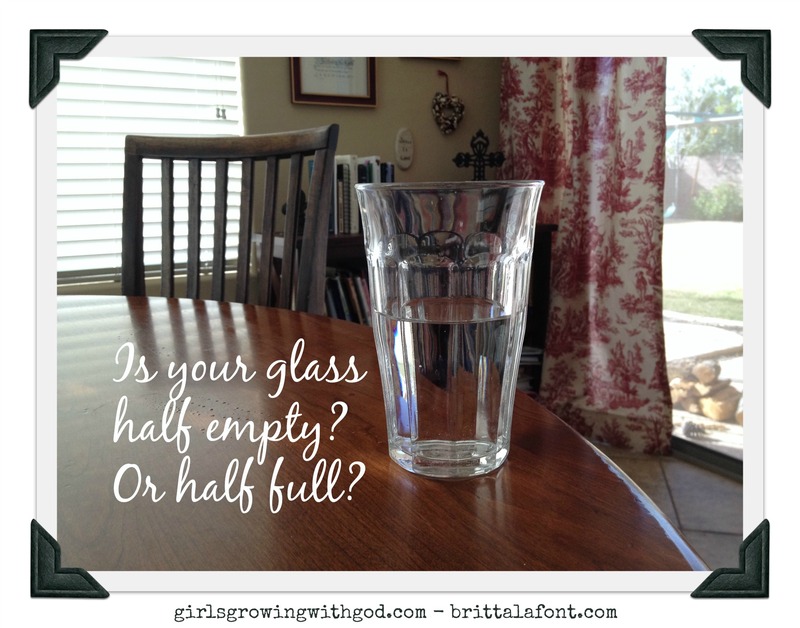 I am sure you have heard this philosophical question: Do you see the glass as half empty or do you see the glass as half full? Most of us would pick one, or the other, indicating whether we are pessimistic or optimistic; this illustration is meant to identify a person’s attitude, maybe even their worldview. But the truth is, it doesn’t matter what we see. The glass is always completely full. It is filled with either water or air, or a combination of the two. When you add more water, some air is removed. When you remove some water, more air is added. Our hearts are the same way. They can be filled with regret or shame or grief. They can be filled with rebellion or anger or bitterness. Or they can be filled with love, hope, compassion, or devotion. The questions is…how can we add the better things? For I do not understand my own actions. For I do not do what I want, but I do the very thing I hate…For I have the desire to do what is right, but not the ability to carry it out. For I do not do the good I want, but the evil I do not want is what I keep on doing. Now if I do what I do not want, it is no longer I who do it, but sin that dwells within me (Romans 7:15-20). When I looked at myself, I was constantly disappointed. Forget New Year’s Resolutions! I was making daily resolutions to be more patient, to forgive better, to pray more, to serve more willingly. But my sin, my self-centeredness and the cares of this world, always distracted me from these goals. Each day I battled my sin, and each day I failed in some way. I grieved over my sin and I truly desired to be the person God created me to be. 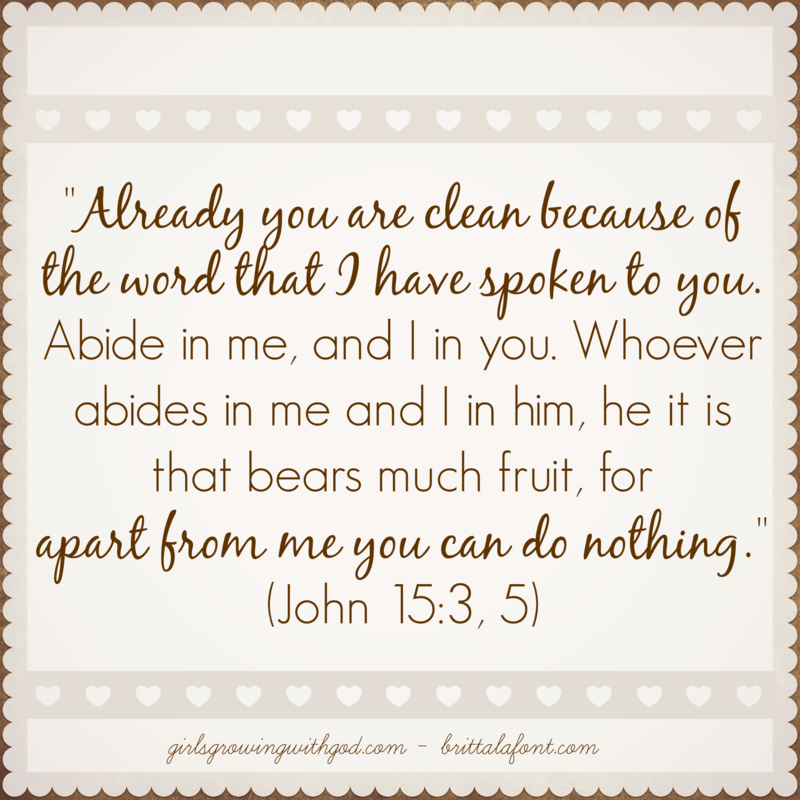 As Jesus abides in us, we are filled with something better than ourselves. We cannot empty ourselves of sin. We must be filled with something better. Now the Lord is the Spirit, and where the Spirit of the Lord is, there is freedom (2 Cor 3:17). Now, instead of resolving to be emptied of sin, I want to fill myself more and more with the love and knowledge of Christ. Instead of fleeing from wrong, I pursue the Lord. As I do, my focus shifts from myself to Him. It is not that we shouldn’t flee sin, or battle the old self…it is just that, in desiring to please God we do the same thing, and it is much more fulfilling! If then you have been raised with Christ, seek the things that are above, where Christ is, seated at the right hand of God. Set your minds on things that are above, not on things that are on earth. For you have died, and your life is hidden with Christ in God. When Christ who is your life appears, then you also will appear with him in glory (Col 3:1-4). Integrity is grounded in deep relationship with God – we cannot have one without the other. Tell me – how’s your glass today? Britta my dear! Soooooo happy to see you back at it! Girl I love you! Winter is almost over! Let’s talk soon! I’m just a girl too! Ohhh – you have been on my mind! My week has been a little busy and have meant to be in touch. Thank you for commenting – it is soooo nice to hear from you dear girl! Oh! So good to hear from you!!! I am glad that you are encouraged – remember that you are never out of His Hand, even when you might feel lost. In God’s economy, nothing is wasted…He uses everything, even our messes. His plan cannot be foiled by us or our mistakes…He is bigger than that! I am so glad – you are one of my most important readers. 😉 I love to read what you write too, Gracie girl. You are a little spot of sunshine!